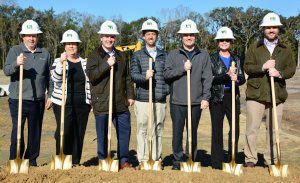 (SAVANNAH, GA) Enmarket, the Savannah-based convenience store chain, plans to build a new headquarters building as part of a new complex at Ogeechee Road and Chatham Parkway. The lot has been cleared and site work is currently underway. The company will build a new 22,000-square-foot office structure along with a second building of equal size that will be used as flex space and will provide room for future expansion. The Enmarket store currently on the site will be rebuilt as a 5,900-square-foot Enmarket, complete with a 70-foot tunnel car wash. The store, car wash and offices are scheduled to open later this year. Included in the plans are two out-parcel lots earmarked for future development, sale or lease. The new headquarters is scheduled to open in the fourth quarter of 2019. West Construction Company is a Savannah, Ga. based general contractor specializing in commercial construction. The company prides itself on its conscientious customer service and dedication to its clients as well as the community. For more information about West Construction Company, go to www.westgc.com.